"You have to take risks. We will only understand the miracle of life fully when we allow the unexpected to happen." Paulo Coelho was born in 1947, in Rio de Janeiro, Brazil, where he was raised, and where he attended a Jesuit school. As a teenager, Paulo was introverted and somewhat rebellious, and pursued his goal to become a writer over the objection of his parents. Because of his rebelliousness, his parents had him committed to a mental institution when he was seventeen. Although he escaped – three times – he was not released until he was twenty years old. Paulo bears his parents no ill will for this – he believes they were trying to save him from himself. Acceding to his parent’s demands, Paulo enrolled in law school. But a year later, he dropped out. He began to explore the life of a hippie, traveling through various countries and immersing himself in the drug culture of the 1960s. When he returned to Brazil, Paulo found work as a songwriter. Indeed, he composed songs for Elis Regina, Rita Lee, and Raul Seixas. In 1974, at age 27, he was arrested by the government, for subversive activity – the people in power found his song lyrics dangerous. He was shortly released, however, and continued his career in the entertainment field, working as an actor, a journalist, and even directing some theatre. He started to write as well, and his first book, Hell Archives, was published in 1982, when he was 35. In 1986, at age 40, Paulo walked the Road of Santiago de Compostela in northwestern Spain, a 500 mile distance. He experienced a spiritual awakening on this journey, which he described in his book The Pilgrimage, published in 1986. Paulo decided to leave his song-writing career and go back to his writing. In 1987 his book The Alchemist was published. In the next year Brida. So popular was Brida that The Alchemist grew to become a best seller! Indeed, it has sold more than 30 million copies, and has been translated into more than 67 languages. Paulo has published 26 books to date. Other of his titles include By the River Piedra I Sat Down and Wept, The Fifth Mountain, Veronika Decides to Die, The Devil and Miss Prym, Eleven Minutes, Like the Flowing River, The Valkyries and The Witch of Portobello. 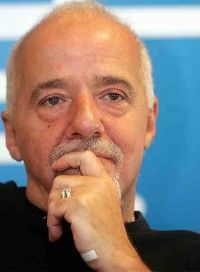 In 1996, Paulo, the best-selling author in the Portuguese language, founded the Paulo Coelho Institute, in order to provide aid to children and the elderly. Paulo and his wife maintain two homes, one in Europe and one in Rio de Janeiro, Brazil. Although he was raised Catholic and regularly attends Mass, he is not a particular fan of the Pope. In September 2007, Paulo was named a Messenger of Peace to the United Nations.